I've said this before, I know. I screamed about it, ranted about it and cursed the world for being this way. But at the risk of repetition, I'm gonna say it again. We pay too much attention to athletes for the wrong reasons—for whom they are dating, for the crimes they commit, for the spectacle they create—and not enough for the genuine achievements they accomplish. And the result of this poorly-paid attention is we overlook indisputably notable accomplishments. For instance, two things happened last week and neither received so much as a blimp on the radar of our ever-decreasing attention. Mike Piazza retired last week and Ken Griffey Jr. hit his 598th HR, closing in on being only the 6th person ever to hit 600. If you missed this, don't worry, everyone else did as well. Despite these guys never once having a sniff of controversy about them—especially when both of them played in, and accomplished all their amazing stats during the steroid era, it seems we'd all rather focus on Brett Farve's locker and Carlos Guillen's hemorrhoids. Ken Griffey is 11 HRs away from Sammy Sosa and is closing on 600, which he should have in a week or two. While that is remarkable enough, consider this...Griffey hasn't played in 160 games since 1999 and only played in 140 twice since 2000. Imagine his career is he remains relatively healthy the past 8 years? Like Bonds, he would be closing in on Hank Aaron's home run record; however, unlike Bonds, without the tawdry and farcical charade Bonds' approach of that record was. Also, he would have shattered the 3000 hit mark years ago and would have been somewhere around 3500 hits. He is 19th on the all-time RBI list, 4th on the all-time walk list, 13th all-time in At Bats per Home Run, 19th in total bases and 27th in all-time Slugging Percentage. All of which would have been considerable higher if he had been healthy—which makes it all the more remarkable and commendable that he didn't go the way of Clemens, Bonds and Sheffield and try to "heal himself" via steroids. No, he accomplished these awesome stats the honest and right way. Frankly, if he had stayed just a little healthier, he'd have been in the conversation for title of the best ever. 12-time All-Star Mike Piazza, as we've all heard, was drafted in the 62nd round by the Los Angeles Dodgers as a favor to Tommy Lasorda, who was a friend of the family. He went on to win the Rookie of the Year award in 1993, as well as the Silver Slugger Award for catchers—which he then went on to win the next 9 subsequent years. Piazza also finished 2nd twice in the MVP voting (once to Ken Caminiti, he of the steroid confessions) In 2000, he almost single-handedly willed the Mets to the World Series by batting .412 in the NLCS against the Cardinals. He had a slugging percentage of .636 against the Yankees in World Series. He holds almost every hitting record for catchers you could think of—bettering marks by Bench, Berra, Dickey and Fisk. Without question, he is the best hitting catcher in the game of baseball's history. However, you wouldn't notice any of this if you were a faithful watcher of sports media. Piazza's retirement didn't get one iota of the 16 hours that "Man-Girl and The Meatball's" radio show spent on Meatball's Hotdog-eating challenge? (Truly Hilarious Stuff!!) Ken Griffeys' approaching 600 HRs didn't register a blip of the hoopla that Bonds' Tour of Shame got. Is ESPN championing Griffeys' becoming only the 6th person in baseball history to 600 HRs in any way? Did it offer the retirement of the best hitting catcher in the history of baseball a smidge of the hoopla that it gave Brett Farve's retirement? No. And it's not right. So, Mike and Kenny, I hope in some small way, this blog makes up of that huge hole. 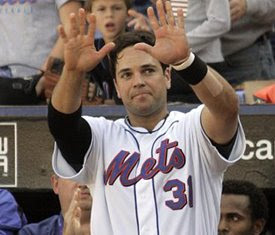 Piazza, enjoy your well-earned retirement. And Griff, here's hoping you stay healthy and make a run way past Sosa and beyond. Good baseball men both. I will make the argument that Griffey in his prime was the greatest player ever. All five tools, including a phenomenal glove in center field. Bonds wasn't good enough to play center field over Andy Van Slyke. And let's not talk about Bonds' dismal throw that allowed a crippled Sid Bream to score in the NLCS. Piazza's only controversy was his hair that one year. In the barber shops across NYC, people were drawing conclusions from it, but nobody can point a finger at the guy for getting caught doing anything really bad during his career. He should have clocked Clemens, though. Clemens hit him in the head and chucked a piece of bat at him. Griffey was the best. That's why I chose that picture of him in centerfield. because he was an amazing CF, prob the best i've ever seen (Don't even mention Andruw Jones). And yes, the hair thing was pretty funny at the time.